Warner Bros. Interactive Entertainment has revealed plans for the LEGO DC Super-Villains Season Pass, which will have six Level Packs and four Character Packs. That will include two Aquaman Movie Level Packs as well as two Shazam! Movie Level Packs, inspired by the upcoming movies. Whereas the DC Super Heroes TV Series Character Pack and DC Super-Villains TV Series Character Pack will add fan-favourites from shows like DC’s Legends of Tomorrow, Arrow, The Flash, Supergirl and Black Lightning TV. Beyond that, there will be additional packs such as the DC Films Character Pack, Batman: The Animated Series Level Pack and Young Justice Level Pack. 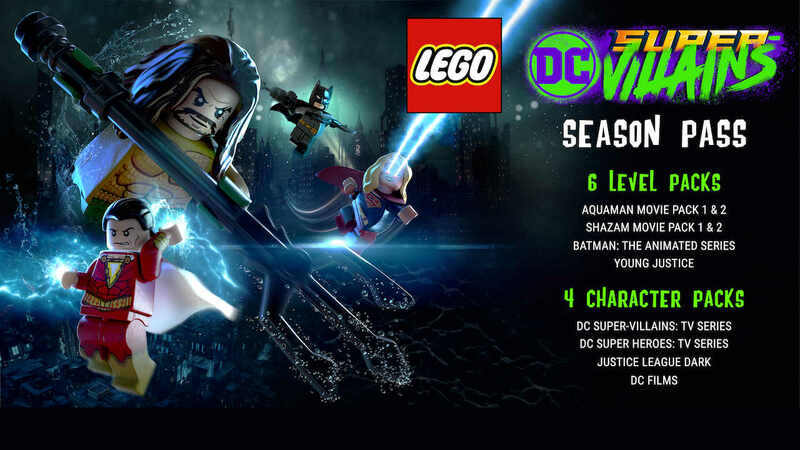 The Season Pass will be included in the LEGO DC Super-Villains Deluxe Edition which contains the game and will provide immediate access to the DC Super Villains: TV Series Character Pack. The physical version will have an exclusive LEGO minifigure, Lex Luthor Superman, while those that choose to buy it on the Nintendo eShop will receive the Justice League Dark Character Pack – inspired by the comic book series Justice League Dark. LEGO DC Super-Villains will release for Nintendo Switch in North America on October 16th and in Europe on October 19th, with the Season Pass to be available separately.